With the help of the Radboud University and MPI Nijmegen librarians I’ve been tracking down an obscure but historically important map of the Togo Hills area in eastern Ghana. It’s a pretty large map, originally made available as an Appendix to a 1913 issue of the Mitteilungen aus den deutschen Schutzgebieten. I plan to make the whole thing available to the broader public in May on the occasion of a workshop celebrating 10 years of research on the GTM languages in Leiden. But I can’t resist offering a sneak preview to show the amazing level of detail on this map. Here is a cut out showing part of Akpafu, with today’s Akpafu-Todzi on the extreme right (click the map to enlarge). It’s not hard to recognise some of the placenames. On the extreme left we have “Eprimkato”, which today we’d probably write Iprimu-kato ‘the top of Iprimu’. The Kɔnsu river flows through the valley below it. The ridge just east of it (and here right of it) is Maukube, translatable as “Mawu mountain”. 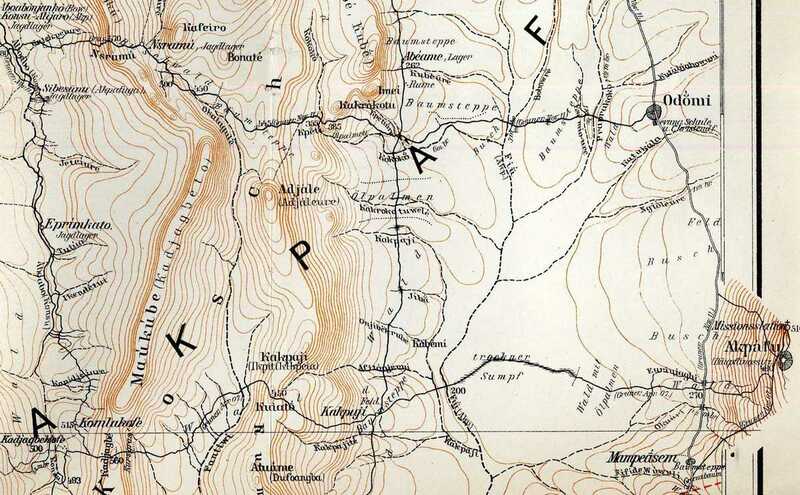 More in the center, the names of rivers like Kakpaji and Fio (“Fiũ”) are also recognisable. Mempeasem, though it was officially funded only in the late 1920s, is already marked as a small settlement here. Many abandoned settlements in the Kùbe mountains are indicated in the accompanying description by Gruner. (Archaeologists take note! Here we find the remains of one of the famous indigenous iron industries of West Africa.) There are also many Jagdläger (hunting camps) indicated, many of which are still in use today by hunters from Akpafu. And so on! More details to follow in about a month’s time. This entry was posted in Early sources, Fieldwork, Siwu by mark. Bookmark the permalink. THIS IS A VERY GREAT WORK TO UNRAVEL THE MYSTERIES SURROUNDING THE LAND MARKS OF AKPAFU TRADITIONAL AREA. MAY GOD GIVE YOU THE WISDOM AND STRENGTH TO ACCOMPLISH THE TASK AHEAD OF YOU.